never not dreaming: Sunday afternoons. Afternoon all! It's Sunday afternoon. On planet iamshoeshopping this means magazines catch-up! During the week I'm usually too busy running around like a headless chicken in between meetings at work, gym, classes and preparing posts for you. It usually is a miracle if I manage to squeeze a film in! Sunday afternoons, on the other hand, are a great time to sit back an relax with a nice cup of full fat milk coffee (full fat rules!) and flick though the best glossies. I get Vogue, Elle and Harper's Bazaar delivered straight to my door and this is my base. This is my inspiration and one of the greatest pleasures! They are also the most read ones, of course. To top up on inspiration I go for Gentlewoman, Russh, Interview, Notion, i-D or anything new I can find on the shelves. Have you got your favourite titles? Anyone that had a chance to get to the passenger's seat of my car knows that they will find a magazine of the seat. 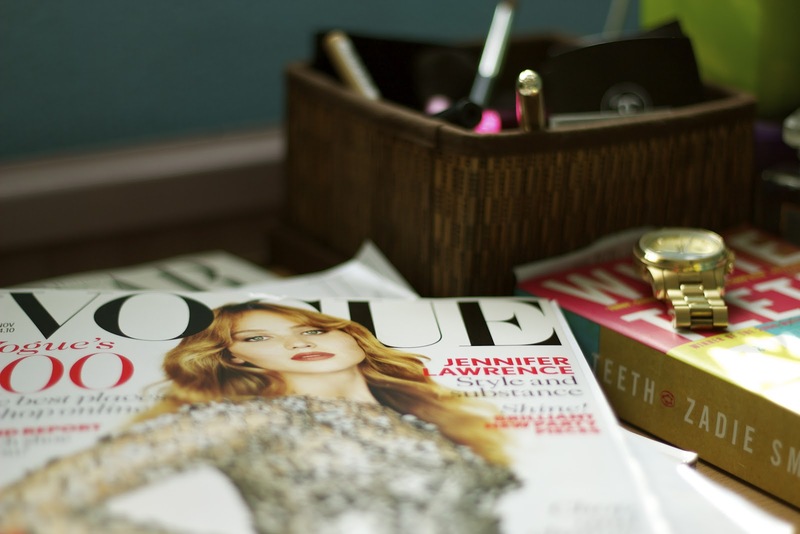 My bedroom sometimes looks like a magazine shop in Soho in London. Just like the picture of Gwyneth below. They seem to occupy every bit of space and take control over anything else. Magazines determine where I put my coffee, where I keep my hairdryer and where I sit down sometimes. I've been collecting them for quite a while and thanks to my friends I have some copies that came to me from Portugal, New York, Turkey or even Tokyo. And the oldest Vogue I have is actually as old as me - published in 1986!